Experts in the field of government ethics apparently had to restrain themselves from laughing out loud at Donald Trump’s conflict of interest plan, as he assumes the office of President of the United States. Trump’s lawyer, Sherri Dillon, outlined the plan at Trump’s Jan. 11 press conference. When it came time for this important announcement, rather than try to explain it himself, Trump turned the podium over to Dillon. He stated that Dillon has designed a structure “that will completely isolate him” from the management of his company. Dillon proceeded to defend the plan she was about to announce by arguing that: It would be too hard to sell Trump’s assets; that a sale of assets wouldn’t be fair to Trump because he wouldn’t get a fair price; that there’s no one outside of Trump’s family who knows enough or could be trusted enough to run a blind trust; that a sale would entail taking on third-party debt—possibly from foreign countries; and that the whole thing wouldn’t work, anyway. Trump is conveying leadership and management of the company to his adult sons and longtime Trump executive Allen Weisselberg. Dillon said the three will “make decisions for the duration of the presidency without any involvement whatsoever” by Trump. And, she said, Trump will donate to the U.S Treasury all profits made from foreign governments who stay at his hotel. Almost immediately, government ethics lawyers reacted negatively. Basically, they said, the plan fails the giggle test. INSKEEP: The president-elect suggests he is going above and beyond. Is he? EISEN [appearing to be holding back laughter]: No. He’s going beneath and below the minimum floor that’s required by law, that’s required by our most fundamental law, the Constitution, that is established by what every president for four decades has done, that ethics require and that common sense requires, Steve. This was a sad day. I wasn’t happy to see what happened here. STEVE INSKEEP: Is she [Trump’s lawyer, Sherri Dillon] right that a blind trust isn’t going to work? On the first point, if it’s a problem that he would still know things in a blind trust, how much more of a problem is it now, where he has this completely unprecedented continuing ownership interest, and very weak protections that were outlined today for communications between and among his sons? Does anybody really believe that they’re not going to be talking about the business? During the same News Hour segment, Inskeep consulted with Richard W. Painter, who was the chief White House lawyer from 2005 to 2007. INSKEEP: What is wrong with turning over management of the company to his sons, who it is said will act independently of him? PAINTER: Well, he will still own the company. I mean, these are parts of the world where there’s very important issues to be dealt with on behalf of the United States and strategic concerns. We can’t have the president have substantial economic exposure himself in these countries and business partners who may be in league with foreign governments. This is an enormous conflict of interests. We also have the president’s name being on buildings around the world in places where it’s questionable whether these other countries can protect those buildings. …That’s going to be jeopardizing the lives of the people who live in those buildings and could drag the United States into a conflict. That’s only the beginnings of the problems. Does Trump divest into a true blind trust? Does Trump use a truly independent trustee, not a family member? Are all Emoluments Clause issues resolved? Is a strong ethics wall put in place for both the administration and the business? The answers, according to Painter and Eisen are no, no, no, no and no. Trump’s plan fails on all counts. The plan the [President-elect] has announced doesn’t meet the standards that the best of his nominees are meeting and that every president in the last four decades have met,” Shaub said. “We can’t risk the perception that government leaders would use their official positions for professional profit. Not surprisingly, our thin-skinned and prone-to-retaliation president-elect reacted strongly to these criticisms. Even prior to his lawyer’s announcement and his own self-serving pronouncements, Trump’s minions in Congress passed a bill that would have gutted the very Office of Government Ethics that was to criticize Trump’s plan. That shameless act of obsequiousness toward Trump met with such a huge public outcry that Congress reversed itself on the ruling. But that didn’t completely stop them. Shortly after Shaub went public with his critique of Trump’s sham of a plan, Republican Jason Chaffetz [R-UT] sent Shaub a letter demanding that he testify before Chaffetz’s Committee on Government Oversight. The letter went so far as to threaten that, if the ethics office didn’t comply—and stop criticizing Trump—its budget could be slashed and its operations thereby undermined. All of this adds up to dangerous times for American democracy. There’s a frightening confluence of behaviors at work here: On the one hand, there are Trump’s obvious conflicts of interest, and his unwillingness to honor 40 years of precedent in divesting from conflicts of interest—or just to do the right thing. 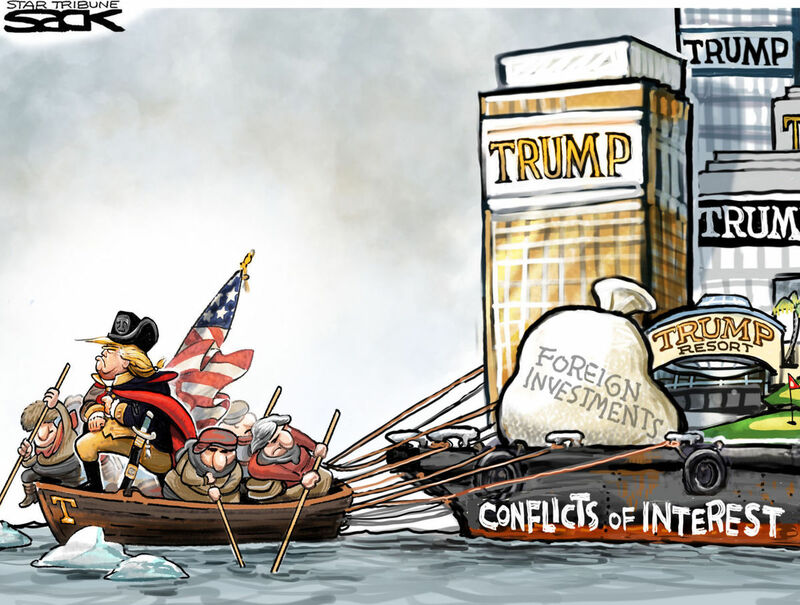 That behavior is merging with Congress’s willingness to look the other way on conflicts of interest and self-enrichment in exchange for a rubber-stamp President, plus Congressional bullying of responsible people who are critical of Trump’s plan to violate long-established ethical standards. The result is a frightening erosion of democracy—from the inside out. And that’s not funny.